Kidlet and I (in a fit of procrastination on my part--I'm not keen on carting the boxes of Christmas decorations in from the garage yet and she keeps begging to put up the tree) went to the movies this afternoon when she got home from school. Hubby was home sick with an ear infection so I figured it would be best to give him some peace and quiet to nap. 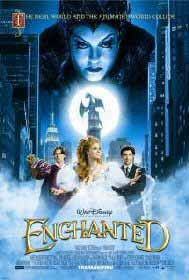 Disney's latest, Enchanted, is a sweet tale of romance. You've seen the previews, unless you've been in a cave. What they don't show you is the wonderful transformation of the heroine, Giselle. Amy Adams does a phenomenal job transfiguring Giselle from a wide-eyed innocent to a red-blooded woman--and she morphs within seconds in the middle of the movie, as if by magic, with anger as her catalyst. Anger is an emotion only villains feel in her animated world. To be angry with someone you care about and retain your feelings of care is a foreign concept. Equally foreign is the tickle of lust Giselle keys by accidentally running fingers through McDreamy's--ahem--Richard's(Patrick Dempsey's) chest hair. The resultant look on her face was priceless. He retreats, she sinks to the sofa, alone; and we feel the poignance of her awakening. All above the kiddies' heads. Susan Sarandon plays the evil queen/stepmother perfectly in step with multiple Disney villainesses before her. Kudos to makeup artist Rick Baker for Sarandon's "Hag" look. While daughter dearest got bored of sitting in one spot and tested every seat in our empty row, I enjoyed her twirling after the film and even joined in during the credits. I haven't stopped humming "I've been dreaming of my true love's kiss..." All the songs were good. Funniest goes to the clean-up song (rhyming "hum" with "scum" and joyfully singing as rats scrub the toilet accompanied by flies and cockroaches...). My favorite song for lyrics is "That's How You Know," sung in an accumulating parade through Central Park. Giselle sings of how you let someone know you love them and understand how they love you through the little things you do for each other. Even if you don't have small children, this movie is a fun romp. Nostalgia and tongue-in-cheek, self-depricating humor aimed at the Mouse's legacy add to the experience. Romance fans must see this film.